Bunpachy is the hard-headed companion of the equally hard-headed member of the Kyoryuger, Kyoryu Gray. Bunpachy is a Pachycephalosaurus, which were dinosaurs that had long hindlimbs and small forelimbs, much like the Velociraptor and Parasaurolophus. Because of this, the body of Bunpachy is remold of the Zakutor and Parasagun body, much in the same way that Ankydon is a remold of Dricera and Stegotchi. Like most other other mecha in the line, Bunpachy suffers from being fairly flat on the sides. Although it is a remold, the toy does a good job of capturing the features of the dinosaur, including the Pachycephalosaurus’ large, bony dome atop its skull. Although Bunpachy’s grey color does not hide the fact that the toy has an hand on its underside, the grey scheme compliments it a heck of a lot better than the bright colors of the other arm mecha. Bupachy is the 4th release in the DX Jyudenryu line of auxiliary mechas. However, it is not actually Jyudenryu number 4. As you can see on Bunpachy Jyudenchi (Beast Battery), he is number 8 of the 10 great Zydenryu.Each battery has a couple of play features. One is that the button on top of the battery can switch the panel inside of the battery. The left picture is the battery in its ready-to-use state. The left is the battery as it lays dormant. Another feature of the batteries, that I completely overlooked until now, is that in dormant mode, the outline of the dinosaur is covered with a layer of glow-in-the-dark material. 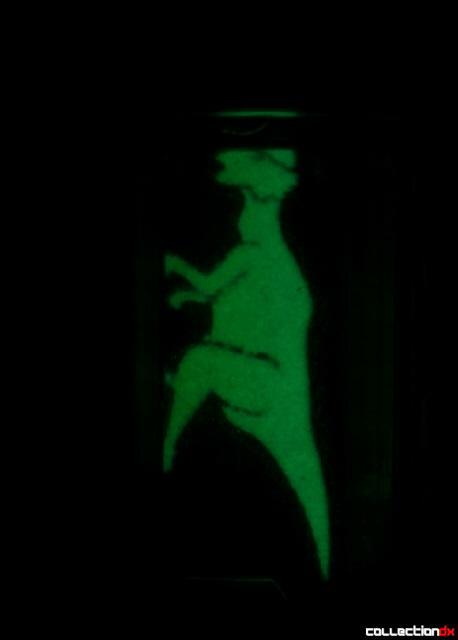 So if you let the battery store some light energy and turn of the lights, you get the glowing outline of the dinosaur. This is a pretty cool, low-tech way of representing the fact that the batteries are storing energy. I feel a bit dumb for having overlooked this feature, which I discovered only by accident with this battery. I am sure that this feature is probably explained in the manual. However, since I do not read Japanese, I feel a little less dumb for not noticing the glow-in-the-dark feature of the battery. Finally, the battery serves the purpose of releasing the weapon on Bunpachy. For this, the battery is inserted into Bunpachy’s mouth and into the battery chamber within Bunpachy’s body. This causes a tab on the hard hat under the dome to release the dome, which is attached to a chain on the tail of the mecha; the chain and spiked ball become a flail for the mecha. Inserting the battery does not completely deploy the weapon, which is a bit of a disappointment. Having to manually pull the chain back is much less exciting than if the toy did it for you. The flail is neat because it gives the dinosaur extra length and the weapon is not confined to staying near the body of the dinosaur. The flail can actually rotate a full 360 degrees around the body, thanks to the yellow connecter piece, which appears to be on a ball joint, on the tip of the tail. So kids could effectively use this toy as a real plastic flail. Talk about your unintended role playing toys! Bunpachy has the same articulation as Parasagun and Zakutor. Go figure! 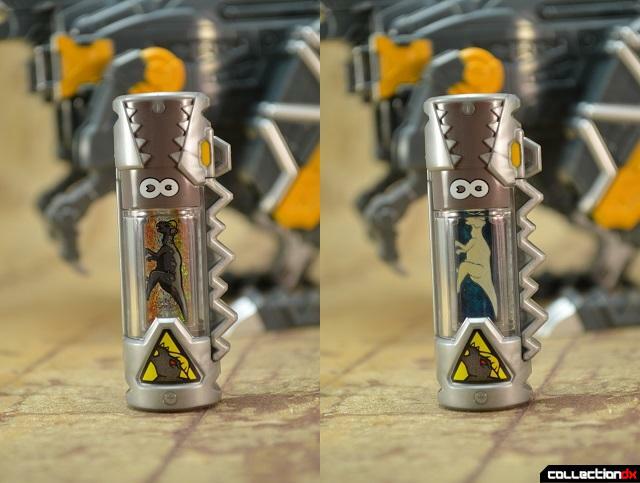 In order to prepare Bunpachy for attachment to the Kyoryuger, you simply have to fold back the legs of the toy and then tuck the arms into a recess on the back of the legs, and release the battery from its chamber. For today’s transformation, Bunpachy is going to be accompanied by Ankydon. Since Bunpachy’s weapon is a flail, it should be no surprise to anybody that this dinosaur becomes a flail weapon for the Kyoryujin Kung Fu combination. The arm can be lifted up, thanks to the shoulder joint on Gabutyra. This will lift the flail off the ground. However, it doesn't really act much like a flail, since the ball just dangles on the chain. You can move the Kyoryujin from side to side, which will swing the flail. However, this ends up acting more like a pendulum than a flail. Although at first, the inclusion of a flail may be a bit odd for the Kung Fu themed combination, it actually makes sense because flails are weapons that were used in ancient China. Hammers, on the other hand ( no pun intended), have also been used for martial arts. Although Chinese hammers look a bit more ornate that the toy-like hammer of Ankydon. “Vamola Much! Bun Bun”, followed by the sounds of chains and gun shots. All in all, this makes for a decent combination and an okay toy. To be quite honest this was a review that almost did not happen. Since at this point 6 of the 8 mechas in the line use 2 molds for the body, I had become tired of the reviewing essentially the same two dinosaurs with different weapons. So I almost cancelled my pre-order for this guy. However, in the interest of reviewing all of the DX Jyudenryu, I begrudgingly decided to forge on with this review. So did this toy win me over? Not really. Since it brings really nothing new to the table, except for the unique weapon gimmick, I am still left wanting a unique experience from this mecha. Lucky for me, the next Kyoryuger review that I will be doing is Pteragordon, since I don’t think I could stand doing a review of another remold! So Bunpachy is a mecha in the line one that people can skip, unless they are completionists or have a particular adoration for this mecha. Holy crap a Pachycephalosaurus with A FRACKIN WRECKING BALL FOR A FOREHEAD! ¿Are these japanesse counterparts the same?.... I mean, statics... articulated-less??? In general, the individual mecha in the Japanese Super Sentai line have more articulation than the American versions. But when you combine them, most of them end up being big plastic bricks. In this line, the Kyoryujin and Pteraiden Oh ( which I have yet to review), actually have some good articulation in the legs. If you want articulation, grab the candy toys. Although not even the candy toys could figure out elbow articulation for the additional arms; even though the candy toys don't use the actual batteries, the arms connect using similar parts, meaning that the attachment points are too long to build in elbow articulation.